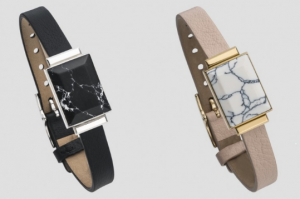 Smart jewelry brand Ringly recently launched its second smart bracelet: the Ringly GO. 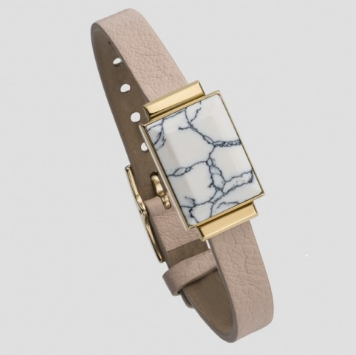 The $125 connected bracelet comes in two color combos, a marbled black device on a black strap with a stainless steel finish and a marbled white device on a light-pink strap that’s 14k gold-plated (both pictured below). 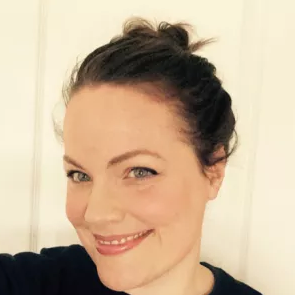 GO does three things: tracks your fitness activities and goals, notifies you of mobile calls and texts, and connects you (through the Ringly companion app) to opportunities to practice mindfulness in the form of guided breathing exercises and meditation. Notifications are imparted through vibration or a small light alert.